At 2:40 a.m. Wednesday morning, at the end of a crowded and angry nine-hour public meeting at Brooklyn Technical High School, New York City’s Panel for Educational Policy (PEP) voted 9-4 to close seven middle or elementary schools and 12 high schools. Over 10,000 students will be affected by the closures. The vast majority of the students at these schools come from poor and working-class backgrounds. The PEP is the governing body of the city’s Department of Education (DOE), which is controlled by the city’s billionaire mayor, Michael Bloomberg. The DOE has managed the largest American school system since 2002, when the city’s elected Board of Education was abolished by the state legislature, and control turned over to Bloomberg and his schools Chancellor, Joel Klein. Eight of the 13 members of the PEP are appointed by the mayor and can be replaced by him at any time. The other five members are appointed by presidents of each of the city’s boroughs. The closing of these schools is in line with President Barack Obama’s federal Race to the Top Fund, which seeks to shut down “underperforming” schools with low rates of four-year graduation, and replace them with smaller charter schools. 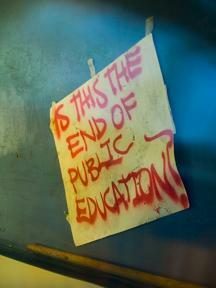 Since 2002, Bloomberg’s administration has closed over 90 schools across the city. The initial closings forced more poor and special needs students, including recent immigrants who were learning English, into other schools that were unable to serve them. This depressed these schools’ graduation rates and other statistics by which the DOE judges success or failure. As a result, these schools, in turn, became targets for closing. Many teachers and parents who attended Tuesday night’s meeting believe that this process is a deliberate plan by the Bloomberg administration and the Department of Education to close larger public schools and replace them with charter schools. On January 21, New York State’s Education Department announced that 57 low-performing schools statewide would subject to “major intervention,” which includes closing. This action is mandated by state applications for funds from Obama’s Race to the Top program. Eight of these schools were closed Wednesday, but at least two dozen more have been targeted in New York City. In a further attack on public education, Bloomberg announced in his budget statement Thursday that teachers must accept as little as a two percent raise during their next contract or face over 2,500 job losses in the next fiscal year, which begins in July. In the months leading up to these closures, protests were held at smaller hearings held in individual schools. Thousands expressed their anger at what they regarded as a foregone decision by the DOE to shut their schools. Over two thousand students, teachers and parents assembled at the hearing on Tuesday night to protest the DOE’s proposals. More than 300 people signed up to address the PEP. So unpopular were the closings that the city administration deployed hundreds of police outside and inside the Brooklyn Tech auditorium in an attempt to intimidate the audience. It was in keeping with police behavior at other recent events. A group of parents and teachers who attended a protest last week against the closings at Mayor Bloomberg’s residence have reported that the NYPD videotaped them. PEP members who introduced the hearing were interrupted with shouts of “liars,” “crooks,” and even “KKK”. The crowd repeatedly stood and chanted, “Save our schools,” and “Shut down Tweed” (the headquarters of the Department of Education). A long line of Democratic Party politicians preceded the public at the microphone, questioning the legality of the hearing, calling for a moratorium on school closings, a postponement of the vote, or defending the record of a single school. Newly elected Public Advocate Bill DeBlasio, the manager of Hillary Clinton’s 2000 campaign for Senate, was cheered by the crowd until he began speaking of his support for the mayoral control of schools, when he was promptly booed. In contrast to the members of the political establishment and union bureaucracy, parents, teachers, and students spoke passionately and bitterly about the closing of schools and their opposition to the entire undemocratic process by which decisions were made. Without a doubt, many thousands of others opposed to the schools closings did not attend because they understood that their opinions would have no effect on the final decision of the panel. The hearing itself was a mockery of the democratic process. Only two minutes were allotted to each speaker, and no vote was taken from the floor. Even in this politically constrained environment, the anti-democratic nature of the process by which the schools were closed and the enforcement of social inequality in education were themes that dominated the hearing. “I teach at Brandeis High School, now being phased out in order to make room for a selective school for the new residents of the gentrified Upper West Side. “The real purpose of this meeting for the parents, teachers and students here must be to reject the attacks on public education, to defend their democratic rights, and to propose an alternative. “This school system does need improvement—and the DOE and government are to blame. So do the health care system, the subway system, and housing. We need job programs and decent pay. Instead, we get threats of cuts on student subway passes. In other words, the attacks on education are only one part of all the attacks of the financial elite to find profits and push the burden of the economic crisis onto the backs of the working class. “The way forward is a political strategy that breaks out of the political limits of the dictates of big business and the two-party system that represents them. Even if some of the 20 schools are not closed, the push by Bloomberg, Bill Gates, and Obama to force a critical mass of children into charters and to sabotage traditional comprehensive public schools would not stop. The proposals for a moratorium and for other reforms stop short of challenging the main problem, the need of the financial elite to carve out more profits, while billions of dollars in cuts to public institutions are made. “The truth is that with 91 schools already closed and billions in budget cuts, the rallies, the lobbying, and the marches have left us beggars at the door of our exploiters. In fact, the teachers’ union has organized rallies and phone calls to 311, but did not oppose Bloomberg’s re-election. “We need industrial action that unites all educators, parents, and workers in a fight for real democratic control, not only of public schools but of the wealth needed to fund the schools. “Defense of education must become the starting point for a political offensive aiming at the socialist measures of full taxation of the financial elite, and turning the banks into public utilities, to get the resources, buildings, smaller classes, and teachers to really help all students—instead of allowing the social wealth to flow to Obama’s bailout buddies and the wars.